Very rare to find and I was lucky enough to have a friend send me this one for free as I searched and searched for it with no luck until he sent this copy to me. It is the size of a soft cover print with soft cover art work and labeling even the ISBN number shows it to be a soft cover which is very strange indeed. 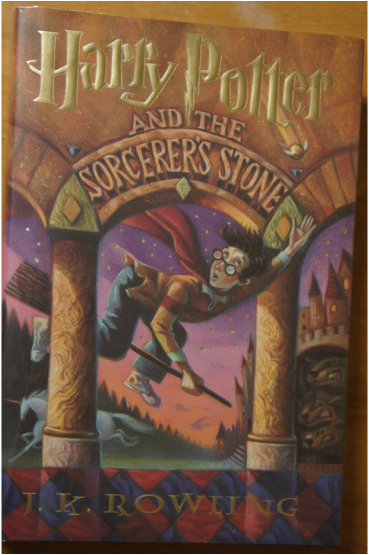 I do not have any information on why this is like this and only have Sorcerer's Stone and Chamber of Secrets in this style. 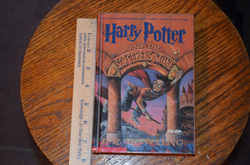 Here is the spine and as you can see by the ruler it is a much smaller hardcover than the original retail hard cover. On the cover it says Perma Bond on the lower right over the pillar. 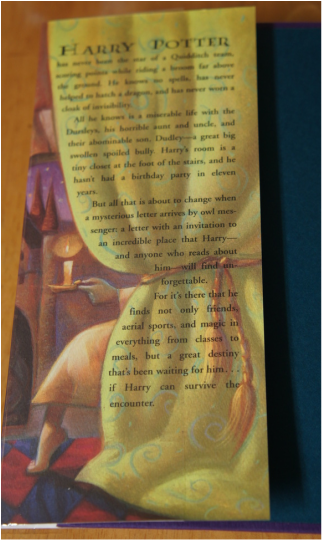 The Words Harry Potter on the jacket are raised (embossed) and on the spine too. The boards are the same color as the retail version with the diamond pattern. 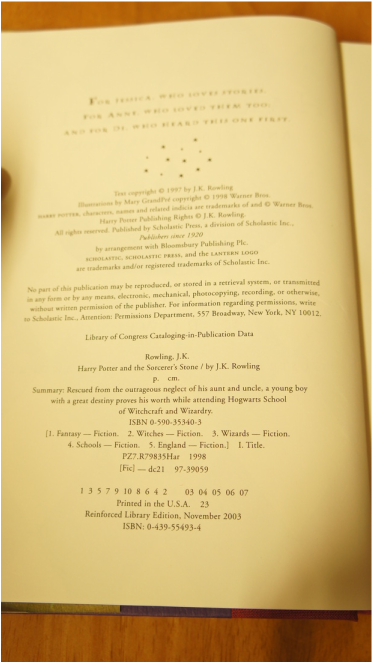 The interior first page and inside of cover are green like the original printing. 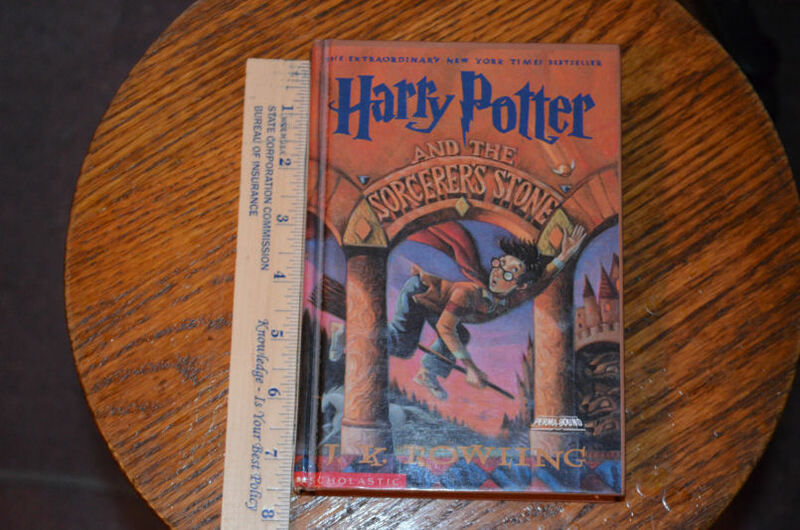 The spine shows the number 1 on it unlike the early printings of the retail version but this was a separate run and a unique run so the number line states its a 1st printing but in reality it was printed well after the first retail printing sold out. The value on these are hard to say, I am no expert but would feel ok paying 20 to 30 dollars for it if I were having trouble finding it but its most likely closer to 20 but take into consideration that these were printed for libraries and to find a mint one like this may be fairly hard which over the years could drive the price up for collectors. Since its a library edition there is no price on the inside flap of the jacket. Everything is the same as the book above except it is a early enough printing to be missing the number on the spine but the interesting thing I have found is that the printing facility number 37 adds a border line to there front and rear boards near the opening edge where the diamonds are. I have only found this on printings from 37 and I have seen them on 1 thru 7 in the series but never on a book printed at another printing facility. library edition and book club editions they do not carry a price. 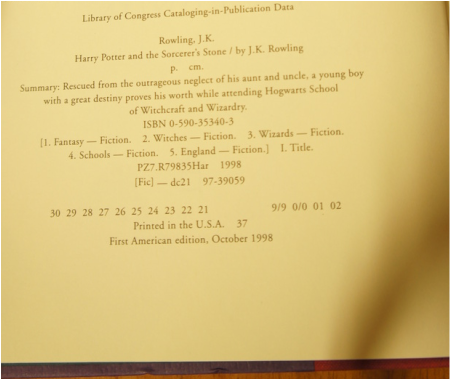 In the picture below you can see the line near the bottom that says "Printed in the U.S.A. 37"
The 37 indicates the print facility, take note that I have found #37 books without the border impression which is weird that one facility would do it two ways. 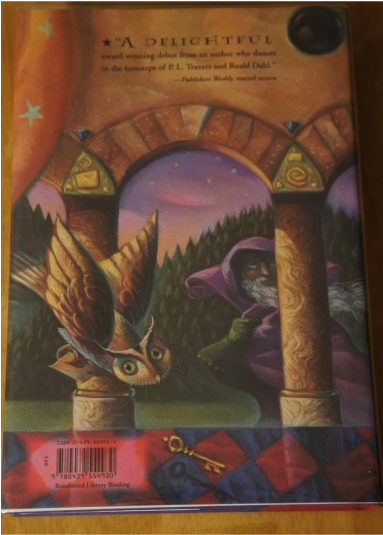 _The cover Depicts Ollivander, Hagrid, and Harry in Ollivanders wand shop where Harry is trying his new wand. This book even though sold as a collectors edition through the school's flier and not sold retail in the stores to the public has a number line in it 10 through 1 which makes me wonder if they are going to put these on the shelves one day. Now thats a steal... Oh I mean Deal. From what I could find out the book is out of print but who knows for the future.